I must admit, I’m not a huge wreath person myself. But I do love the inspiration that comes in the form of the wreaths. I even keep a Pinterest wreath board to stash all of that inspiration. Each time I see a wreath that I really love, I’m always thinking “what else could be done with this idea”. 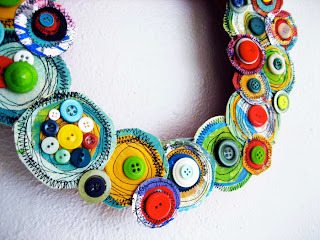 Like this wreath I found in the archives at Alisa Burke’s blog (which I LOVE). Alisa handpainted canvas squares, then cut circles and stitched them together before adding buttons and creating a wreath. 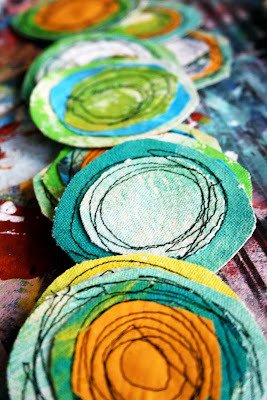 I would actually love a bunch of those circles as a wall hanging…so the inspiration spark has ignited. Earlier this year I remember stumbling across a blog talking about “the non-wreath”, and that really stuck with me. Kicking myself now for not marking it somehow so I could give credit where credit is due (if it was you, and you are reading this, let me know!). I must be a non-wreath kind of person. After all, I really like the idea of putting other things on the front door of our home. I just bought a really large rectangular frame (like 4 feet tall) at the thrift store this weekend and I’m thinking to myself…”do I dare to put this on the front door to our house with some type of decor inside of it? What will my conservative Swedish neighbors think?” Perhaps they will let this one slide since they’ve already seen me doing a range of odd things around the home? Regardless of whether that big frame ends up on our front door or not, I’ve started to now collect “non-wreaths” on another Pinterest board, so let me know if you have one that I can add. Just leave a link in the comments below. What’s your style? Wreath? Or the Non-Wreath? I just LOVE YOUR BLOG! Sooo nice! Very cool! 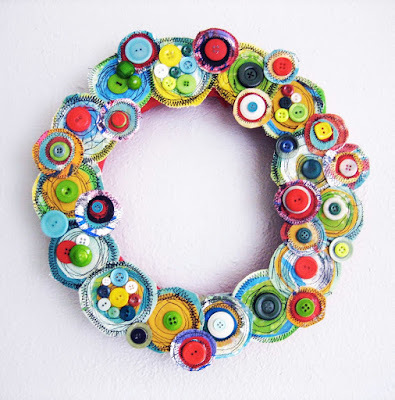 Great way to use up scraps, you could use holiday colors to make Halloween, fall or Christmas wreaths. I'm not a big wreath person either but I always find them oddly fascinating. The sunflower one you pinned is awesome! Hanging Your Art Trash? Or Art!